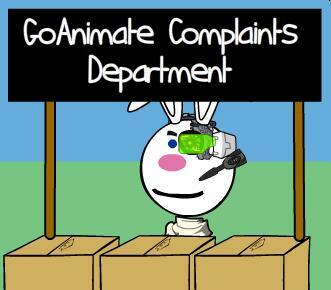 Robot Turkey, Cyborg Bunny and GoAnimate Complaints Dept. 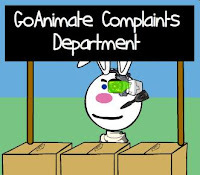 GoAnimate Complaints Department - Cyborg Bunny was prompted by me being featured on the first episode of GoAnimator, RoTV's series, Robot Turkey. However the idea to replace Happy Bunny with a robot rabbit at the complaints desk is something I thought of way back in December of 2009. GoAnimate, Product Manager, Nicolas, created his own custom character set known as Isometrix which I featured in my animation, Blink in December of 2009. At the time Nicolas suggested to me he would create an Isometrix rabbit character. I said, if he did I'd definitely use it in an episode of the GoAnimate Complaints Department. I guess Nicolas got too busy because, as far as I know, he never made a rabbit Isometrix character so I never used it as a robot rabbit on the Complaints Desk. Then in January of 2011 RoTV released his parody of Adult Swim's, Robot Chicken, called Robot Turkey, featuring me, which prompted me to revisit the idea of a robot Happy Bunny. Ro's animation is below. If you watch it first it'll help you understand some of the references in Cyborg Bunny. RoTV invited me to record my own voice for his episode which was pretty cool. Though he only gave me my lines so the jokes were still a complete surprise to me when he released the episode. The opening Bat Stick preview came about as a prize I awarded to the person who made the best comment on Episode 1 / Part 3 of Bat Storm. The winner could have any of their animations featured on this episode of the Complaints Dept. (Note: GoAnimate CEO, Alvin Hung, really did give a presentation at TEDx in Bangkok). Musics Milky Boy was a very controversial GoAnimate member for about 5 months before he suddenly quit the site, renouncing it as a waste of time. He gained a genuine following of core fans but he also systematically tried to fan every new user, knowing that a good percentage would fan him back. His catch cry was 'Everybody deserves at least one fan'. He not only managed to get multiple animations listed on the Top Animations page frequently he also progressed through the sites levels to level 28 (I think) in record time and is the only GoAnimator to be the featured animator two months in a row. Musics Milky Boy was a fairly young member (aged 15-16 I think?) he seemed to be involved in a lot of forum discussions that would incur the wrath of many much older members. The girl complaining about no one believing she is really dead is based on an actual user (who's name escapes me now) who pretended to be dying right to the point of writing a last forum post on the day she supposedly died. She later admitted to faking it all for the attention. The phrase "We are the borg of GoAnimate" comes from a GoAnimate site meme that only got minor traction (unlike the 'plague' meme before it that really did spread like the plague on the site) in October/November of 2010. Essentially it involved users creating a 'cyborg' version of their profile picture and changing their username to read their name 'of borg'. The Lil' Peepz theme, just like the Comedy World theme before it, came with its own pre-made Santa character. Oh... in case you were wondering... anything that sounds like a real human voice was voiced by yours truly.